Teaching in a therapeutic day school for children with a primary disability of EBD, a calm corner was an essential part of my classroom - BUT - I would dare to say that its an essential part of any classroom (general education self contained, PE class, every single classroom!). Why? Creating a space that is dedicated for children to sort out big, often uncomfortable emotions is essential in building their social emotional knowledge and their self determination skills. What is a calm corner for? 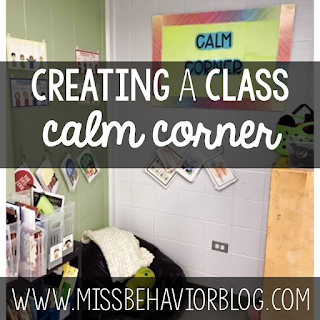 A calm corner is a self-referred calm down area in the classroom where students can relax and sort out big emotions (anger, jealousy, frustration, sadness...). The calm corner has calming tools in it, like a bean bag chair, a few stuffed animals, hand fidgets, visuals for breathing exercises, calm down jars, books, or any other items that would assist your student population in calming down. This has always been a self-referred spot in my classroom because I like that it allows student feelings to be validated. Occasionally I will prompt a student with, "Have you tried using the calm corner? ", but this isn't an area that I would send children to. What if a child is having an emotional moment that's intruding instruction? Can I send them? It is completely up to teacher discretion if you would want to use the calm corner in this way, but I found that to be really confusing, and using the calm corner for two separate purposes. If a child is intruding instruction, I used the "time out" strategy from Responsive Classroom - but we called it a "break and reset". Time-out often has really negative connotations for kids, and I found it was better to rename it so they would have greater buy-in with the difference between a "break and reset" and a "time-out". I also made sure that our "break and reset" area was in a different space than the calm corner to avoid students conflating the two spaces. Don't your students destroy the calm corner? Actually, no! On occasion, I had students rip items off of the wall or throw fidgets. The simple response is to have them put everything back the way they found it, and have a conversation with them about why that's not acceptable. I have found that if students are taught the importance of the calm corner and why we treat it respectfully, they are much less likely to destroy it. Do students waste time in the calm corner or use it when it's not necessary? At the beginning, yes. We do go over what the consequences are of wasting time in the calm corner: someone might really need it when you're using it unnecessarily, you're going to have to make up your missed work. Any time someone is in the calm corner, they aren't able to fully participate in the lesson going on around them because they do not have all of their materials. With each situation being different, I personally never had a blanket policy of how students were to make up missed work while they were sorting out their emotions in the calm corner, but in one way or another, all work is made up. It was fairly rare that I had a student abuse the calm corner, but when it did happen, I found their natural consequences taught the student themselves about why that's an unwise choice. How can I encourage general education/fine arts/PE teachers to create a calm corner in their rooms? Getting teacher buy-in isn't always easy, but I do believe that showing them the benefits can be encouraging, plus helping them in gathering the materials they need to make one successful. It can be as simple as a bathroom rug and a pillow with a bookcase to help make it more of a "corner". Showing them how this can really help make their classes run smoother and make students feel safer can make a pretty encouraging case! 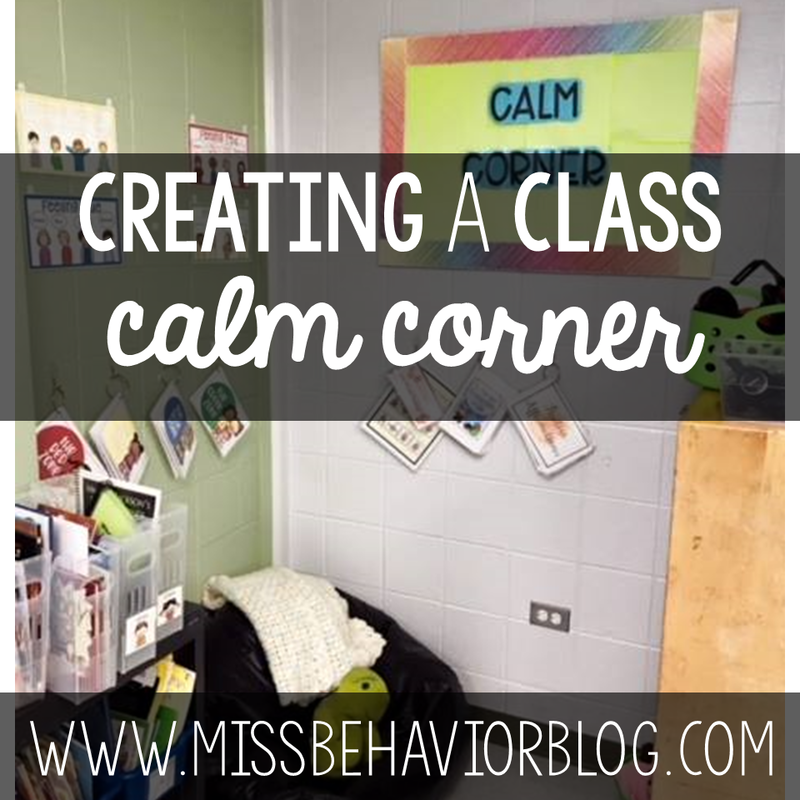 Do you have a classroom calm corner? Hello! Could you please share what you have hanging on the wall in your picture? Are those all products in your TPT store? Thanks!